The purpose of the Human Concerns Committee is to discern the needs of the people in the parish and wider community – especially the poor – and identify resources to meet those needs while enlisting the active support and participation of parish members. Our two ongoing projects are working with the Norway Helping Hands Food Pantry in Wind Lake and the Love Inc. Meal Program in Burlington. We do weekly food drives for Norway Helping Hands with a special monthly food and non-food item. In February we have a Souper Sunday that corresponds with Super Bowl Sunday where we ask parishioners to contribute a can or two of soup to the food pantry. 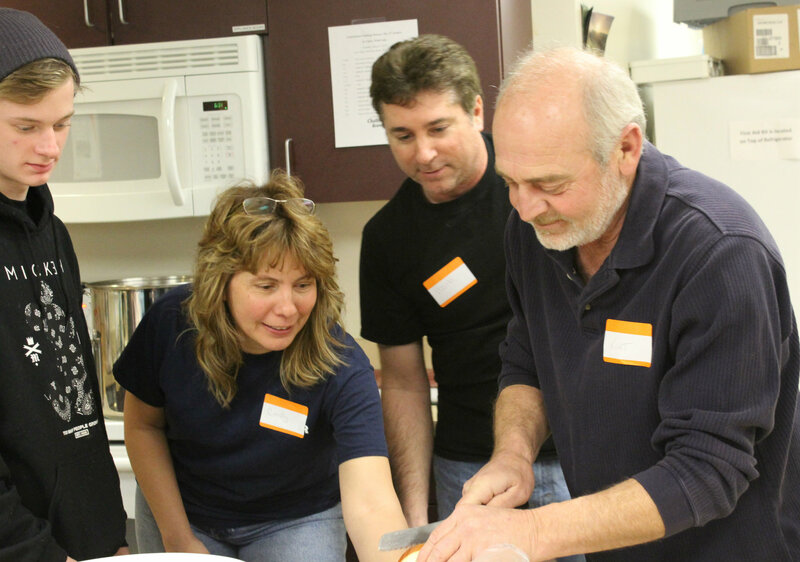 The fourth Wednesday of each month, St. Clare prepares, delivers and serves a meal at Love Inc. in Burlington. There is a sign-up book at the Information Station in the narthex for parishioners to sign-up to cook, bake or serve at these meals. We usually serve between 30 and 40 people each month. Our newest project is preparing Food Boxes for the House of Peace in Milwaukee. In 2017, the second year we had this drive and we collected enough money to fill 200 boxes of food and make a monetary contribution. We surpassed that goal in 2018! January is Pro-Life month and we host two events that month. We work with the Women’s Care Center in Milwaukee with their Baby Bottle Campaign. We also sponsor a baby shower for Life Choices in Burlington. There is a cradle in the narthex and parishioners help us to fill it with new baby clothing, blankets and diapers. The Human Concerns Committee presently consists of about twenty members. We meet the second Tuesday of every month at 6:00 in Holy Family Hall and are always looking for new members. Please consider joining us at our next meeting. For more information please contact Debbie Klamert at debbieklamert@yahoo.com or 262- 895-7524.